What is Hemp Extract CBD Syrup? 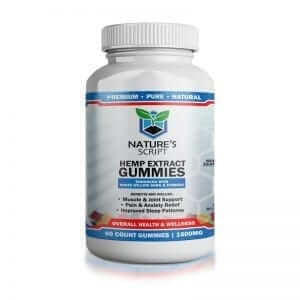 Known for its therapeutic properties, Hemp Extract is a natural supplement derived from Industrial Hemp plants. It contains a powerful compound called CBD, or Cannabidiol, which complements the natural functions in your body to promote physical and mental health. 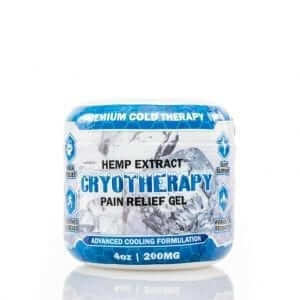 Hemp Extract may help relieve pain and anxiety, and it does not have the harsh side effects or addictive properties of traditional medications. 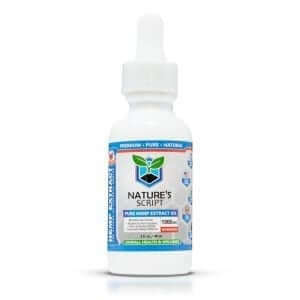 Nature’s Script Hemp Extract contains no-THC, so it has no psychoactive properties, and it will cause a “high” feeling. It’s also federally legal and highly safe. Our CBD Hemp Syrup delivers the potent benefits of CBD in a liquid form. 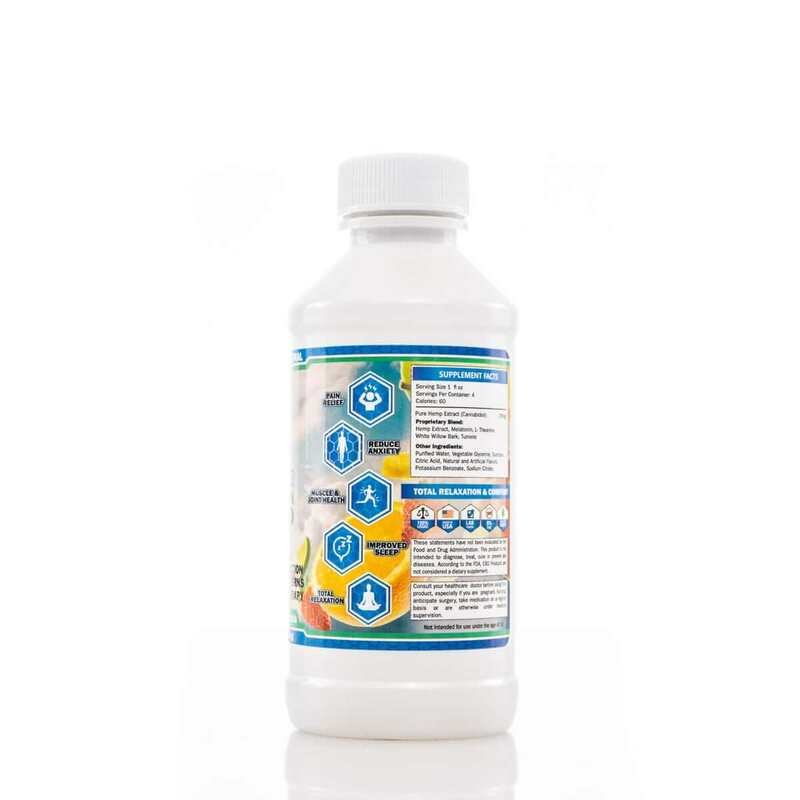 Our Hemp Extract Syrup combines a pure dose of Hemp Extract with other naturally relaxing ingredients like Melatonin, making it an excellent choice for individuals looking to help relieve anxiety and insomnia. 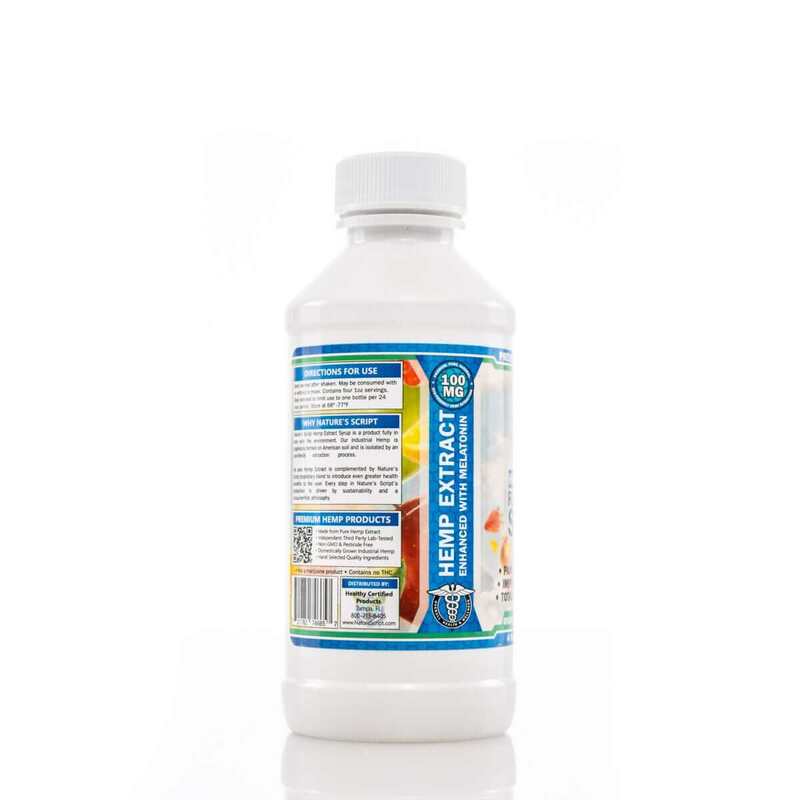 Available in a refreshing fruit punch flavor, our Hemp Extract syrup does not have a medicinal taste or unpleasant thickness. Light and fruity, it can be taken on its own or mixed with a beverage. What are the potential benefits of Hemp Extract Syrup? As mentioned, Hemp Extract contains a compound called CBD, which is a natural cannabinoid. Cannabinoid receptors are found naturally in your body’s Endocannabinoid System, or ECS, and they help to regulate various functions throughout the body including sleep cycle, pain sensation, mood and more. Because the cannabinoid receptors in your body impact many areas of health, Hemp Extract can help with a wide variety of conditions including insomnia, anxiety, chronic pain and inflammation. Our CBD Hemp Syrup is a popular choice for sufferers of insomnia and anxiety, as it is specially formulated to promote natural rest and help regulate your sleep cycle. How do I take Hemp Extract Syrup? As a liquid form, Hemp Extract Syrup allows you to personalize your dose. You can pour a smaller or larger dose depending on your daily needs. If you are new to Hemp Extract, we recommend starting with a low dose, like five to ten milligrams. You can slowly increase your daily dose until you achieve your desired results. For best results, take Hemp Extract syrup daily. Our CBD Hemp Syrup can be taken on its own like a liquid medication. You can also mix it into your favorite beverage. We’ve heard our customers mix Hemp Extract Syrup with soda, smoothies, tea and fruit juices. From plant to production, our top priority is quality. We source our Hemp Extract from premium-quality Industrial Hemp grown with sustainable methods in the United States. We manage every step of the production process in-house, so we stay close to our products. Nature’s Script focuses on the purity and potency of your Hemp Extract, which is why we work with a third-party lab to confirm the quality of our products. We are experts in the Hemp industry, and we’re proud to deliver some of the most potent and pure Hemp Extract products available on the market. What Are Other Hemp Extract Products Available? I am new to the whole Hemp thing. The customer service girls were very nice on the phone and took their time giving me advice on what products to buy for my needs. I’m trying the syrup based on what they said. Because of my depression I wanted to try this and after a few days I did notice that I feel better and wanted to be out of the house more. I have been taking this for over a few weeks now and I haven’t been this happy in a long time and not taking meds just the syrup. 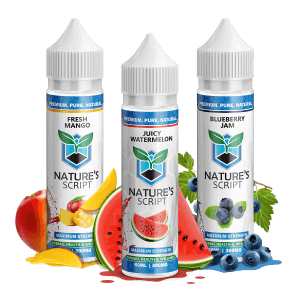 thank you Nature Script for making such a great product. Very amazed how well this syrup is able to minimize inflammation. I had no idea hemp could do this. Makes me feel so much more relaxed when I am around a lot of people in crowded areas. Works wonders. I just love it..
Happiness is what this syrup has given me. I take this syrup before I go to bed because I never can seem to get a good nights rest. It seems to work pretty good for me. The only thing is that I dont really care for the taste. I am so impressed! This is so awesome. I will be ordering again! I am not too keen on the flavor. Could you come out with some different ones? I have been taking a few spoonfuls at night and it really helps me relax after my day and helps me get to sleep. Could you come up with one that is stronger? this actually helps me to stop yelling at my kids! This syrup really relieves my anxiousness, makes me feel so calm and at peace. This stuff wsorks like magic, I am new to the CBD world, but man so far I am loving your products! Excited to try some other things from your line. I usually don’t leave reviews on products, but I want to share how I definitely feel more relax after taking a full table spoon of this stuff, going put my husband on it because he can get very anxious with work. Before I found your hemp extract syrup I was anxious and nervous all the time. Now, I keep a bottle at my desk that I can use any time. And I do. Wonderful. Bought a bottle of the hemp syrup hoping to help me with anxiety. I’ve been suffering for years and nothing helps. Hopeful this will. 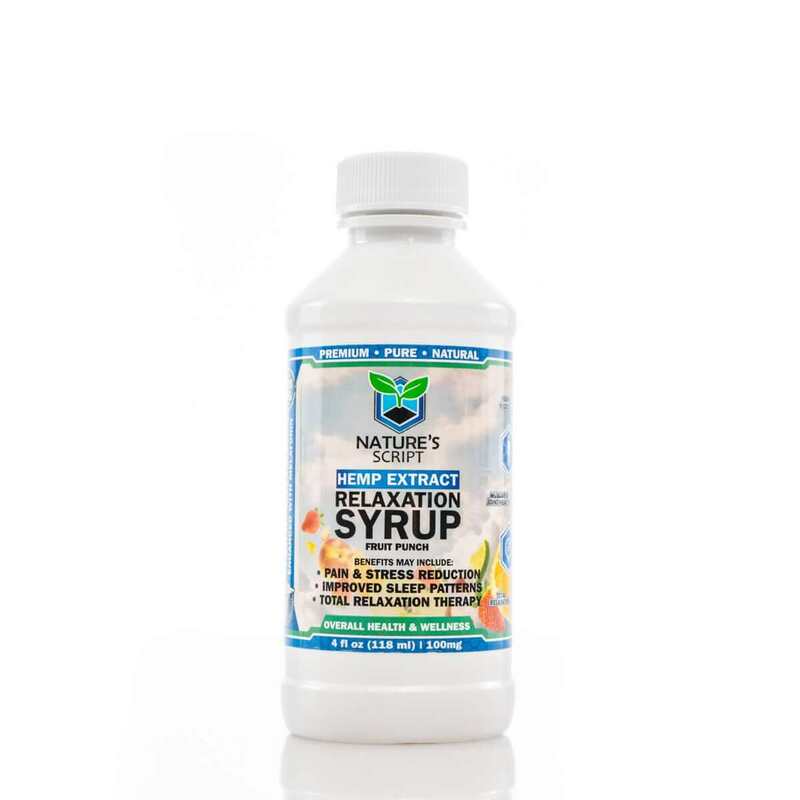 As an avid user of nature’s script products, I used a coupon code I received in an email and placed my order for the hemp syrup. Can’t wait to try it. I didn’t get much out of this product. I’m trying the oil next. i’ve been reading a lot of good things about hemp extract for depression and anxiety. this syrup says it will work for that so I will give it a shot. Bingo. I just used my 25% off code to order 2 bottles of the syrup. Thanks a lot. I had no idea what to expect when I got this. It was suggested to me from a co-worker. As it turns out, I found it worked very well for my insomnia. I’ve been able to sleep and don’t wake up in the middle of the night. It relaxes me, I will be buying the syrup again. Taste isn’t bad. This really took the edge off and made me feel like I was floating away.. I’m glad I waited until I arrived at home after driving to try it. I guess that’s the hemp in it. So far so good with this. My back pain has been reduced.